The thylacine (thi-la-seen) is a extinct marsupial (mammals with a pouch) that roamed Tasmania till 1936 when Ben the last known thylacine died of being neglected. On a cold winter's night, the zoo keepers 'accidentally' left her shelter locked, so she had no way of staying warm (other then her thin fur), and she froze to death over night... When her keepers found her body, they decided to send her to the garbage dump. Some people believe that the thylacine is still alive, yet their is little proof for now. 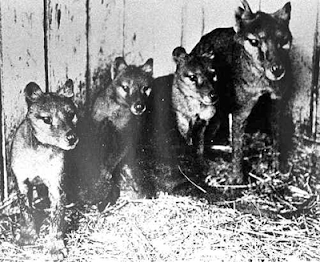 Their are even people saying that they have been attacked by a thylacine. DNA has finely bin extracted from this joey. They have found that the peace of DNA helped to develop the cartilage through out the body. This gene is called the Col2a1 gene. 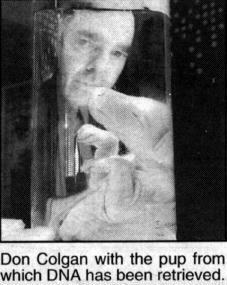 Maybe someday we can bring this wonderful animal back to life. 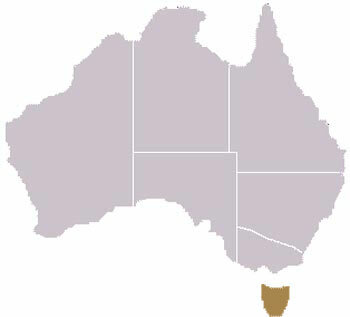 The thylacines range used to be all of Tasmania but now the range is ether extinct or much much smaller today. 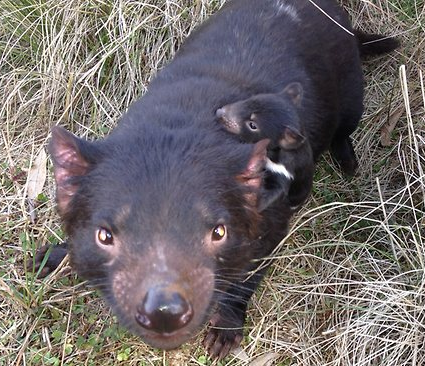 The Tasmanian (tas-may-nee-an) devil got its name from the sounds it makes when eating or fighting for females. The Tasmanian devil is considered a pest because of eating dead livestock and keeping the people awake at night. Though this can't be more wrong. The Tasmanian devil is endangered mostly because of the Devils Facial Tumor Disease or D.F.T.D. Scientists are looking for the cure for D.F.T.D but so far there's no luck. The only way is to have dangerous surgery that can kill the unfortunate animal if a mistake is made. But if the D.F.T.D has progressed to far into the head and neck they have to put the Tasmanian devil down. D.F.T.D is a contagious cancer which makes it worse. Tasmanian devils are mostly scavengers but they also sometimes hunt (though nothing bigger then a wombat). They are also great parents. A joey will be taken care of by the mother until they are about a year and a half old. Young Tasmanian devils often clime trees to smell out a dead animal and to avoid competition from older Tasmanian devils who are too big to climb trees. The Tasmanian devil actually helps the environment by scavenging dead animals or carrion. By eating the dead animals they help reduce the risk of disease in the environment. The Tasmanian devil is only found on Tasmania. But do to deforestation, hunting, and D.F.T.D this animal might lose its home.